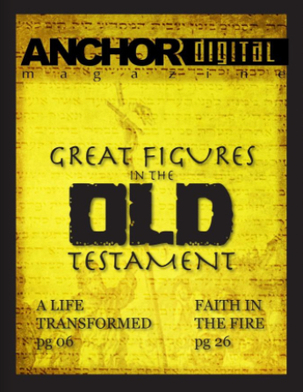 This article appeared originally in the March-April 2014 issue of Anchor Digital Magazine. who seemed destined to best him. His previous prowess on the field of battle meant nothing. This tiny invader was far more fearsome than any opponent he had faced. And it would take the power of God to rid him of it. Testament. A successful commander in the Syrian army, the author of Kings describes him as both a great man and valiant warrior (v.1). The lone blemish on this otherwise impressive fellow is that he is stricken with leprosy. While the biblical term can describe a variety of different skin diseases, it is apparently worrisome enough that Naaman's king sends a letter to the king of Israel asking for aid. The king of Israel seems to assume that the request is disingenuous, and perhaps nothing more than a ruse to escalate conflict between the two nations (v.7). The prophet Elisha hears the news of the king's grief. He sends word that the king should Naaman to visit him. The reason offered, though, should catch our attention. Elisha notes that Namaan will know that there is a prophet, rather than a physician, in Israel. The Syrian general has a spiritual need whose importance greatly outweighs his physical condition. Elisha offers a better remedy than the one Namaan is seeking. Naaman seems to have gone into the encounter with significant expectations (v.11). Elisha does nothing to fulfill them. In fact, Elisha does not even go out to meet Naaman. He merely sends a servant with a message to dip in the Jordan River seven times. Namaan expected Elisha to meet with him personally, and anticipated an impressive religious ritual. Having gotten neither, he storms away in indignation. In spite of his lack of understanding, we must understand that Naaman is no villain. In fact, he appears to be a rather remarkable individual. In addition to his accomplishments as a man of war, he is willing to listen to the advice of those far beneath him on the social ladder. His arduous journey to Israel is prompted by the advice of a little servant girl. He curbs his rage and follows Elisha's instructions on the advice of his personal attendants, who refer to him affectionately as “father.” Clearly Naaman is a man who earns the loyalty of others and is willing to heed their advice. But he is also a warrior who struggles against one of the greatest of foes: pride. Pride is an enemy of us all. It is by an appeal to pride that the serpent tricked Eve into eating forbidden fruit, effectively murdering the entire human race. It is pride that caused the downfall of the devil himself. Self-reliance, self-interest, and self-promotion comprise an unholy trinity that threatens the spiritual health of every person on earth. In some ways, Namaan's attitude is precisely the same as many people in the religious world today. He has an attitude of self-sufficiency that is broken only by his need. Like many religious folk—even those Christians who are less than careful—Namaan has grown both confident and comfortable. Yet his time of need has rudely interrupted his contentment. A second quality seemingly demonstrated by Naaman often can be found among the religious: the desire for a spiritual quest. From the severity of his response, we might conclude that he may have expected to be called upon to perform a great deed that would demonstrate his worthiness to be healed. The history of religion is filled with such expectations. Believers of any number of faith traditions have expected religion to be something like an epic quest, fraught with difficulties and trials that they must overcome. Some of these difficulties are self-imposed, such as the adoption of an ascetic lifestyle in which the believer chooses to deny himself food, pleasure, or creature comforts. In Naaman we find a rare biblical example of a Gentile putting his trust in the one true God. After dipping in the Jordan and emerging with skin like that of a young warrior, he states, “Behold, I know that there is no God in all the earth but in Israel” (v.15). When bidding the prophet farewell, he uses the diplomatic language of “Go in peace,” signifying that he now stands in a covenant relationship with the prophet and his God. Leprosy is a terrible disease, and Naaman was no doubt glad to have been cured. Yet how much more thankful can we be when we understand the relief that we have in Christ? If sin is the ultimate sickness, and death its inevitable result, then believers everywhere should have the same spirit as Naaman after his restoration: a new life and an eagerness to follow God. Paul tells the Corinthians that we are “new creations” (2 Corinthians 5:17) not merely made whole, but transformed entirely. Such is the joy for those who submit to the care of the Great Physician.